A shoe insert ( 10 ) which includes a sheet-like pad ( 12 ). 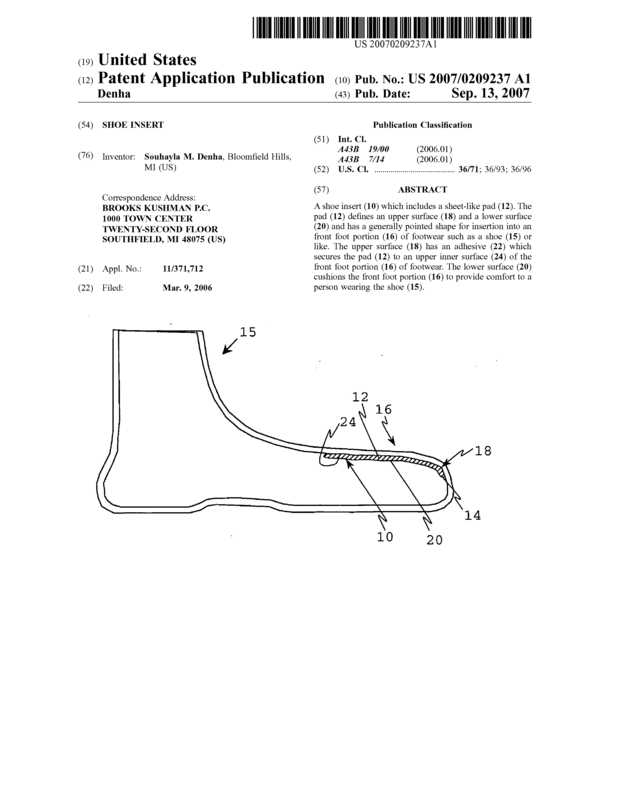 The pad ( 12 ) defines an upper surface ( 18 ) and a lower surface ( 20 ) and has a generally pointed shape for insertion into an front foot portion ( 16 ) of footwear such as a shoe ( 15 ) or like. The upper surface ( 18 ) has an adhesive ( 22 ) which secures the pad ( 12 ) to an upper inner surface ( 24 ) of the front foot portion ( 16 ) of footwear. The lower surface ( 20 ) cushions the front foot portion ( 16 ) to provide comfort to a person wearing the shoe ( 15 ). Q: What you are looking for (an outright sale, a license with royalties or another form of partnership)? Q; Has your invention been previously sold or marketed? Q: What is the market potential? Q: Do you have specific conditions for the sale? Q: Do you have other pieces of intellectual property associated with your invention (such as a trademark, a website, etc.)? Page created at 2019-04-22 14:09:21, Patent Auction Time.